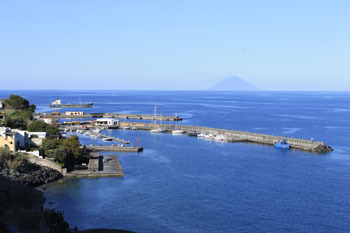 Salina is the second island of the archipelago as extension, separated from Lipari by a channel of 2km, where the depth is not superior of 400m. Situated in the central position it assumes a strategic role; an ideal point of reconnaissance for those who want to explore the isles without giving up a well-equipped touristic boathouse, and a village able to satisfy every kind of need. The island is easily discoverable thanks to its two mighty mountains: Mount Fossa delle Felci, and Mount Porri, which respectively represent the first and the third highest peaks of the Aeolians. Salina has a coastal morphology of an extraordinary beauty, and you cannot avoid visiting such places as: the Pollara Bay which with Balate zone, its stack, and the natural rocky arch, constitute the submersed part of the collapsed crater where the homonym village is situated; the beautiful lake of Lingua, divided from the sea by a thin piece of earth; the small commune of Malfa with its typical houses which dominate the headland; the small fishers’ village of Rinella, which, from its bay where the sea boils, climbs up a steep slope; and many other things will admire you and will create a desire to come back again. 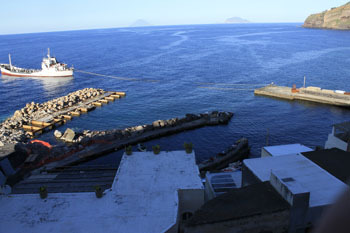 On the island, which is 13miles long, there are Santa Marina and Rinella ports for the mooring of ferries and hydrofoils, a touristic boathouse in Santa Marina, a boas camp in Rinella, and docks of Punta Lingua, Scalo Galera, and Capo Faro, no more usable because destroyed by storm surges. Water surface area: 25,000 sq.m. Access time: 7:00 to 21:00. Speed: up to 3 knots. Depth: on the quay from 4.6 to 6 m.
Radio: VHF channel 11 dock Salina. Situated in the eastern zone of the island, corresponding an economical centre of the island, the port is provided with a landing place for hydrofoils and ferries, and a touristic boathouse, surrounded by a breakwater fortification with wharves, having a capacity of 150 boats. Provided with the slipway, it offers good means, and a well-hidden port in every condition; it suffers the winds blowing from the south-west. 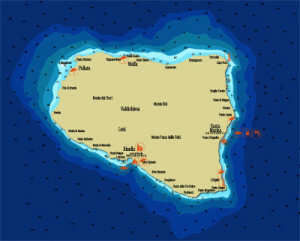 The zone next to the port is well-served, and is the only place of the island where to refuel; there are also hotels, restaurants, groceries, Emergency Medical Service, foodstuffs, workshops, info point, and the post-office. On the south of the boathouse there is a wharf of Pozzo D’Agnello, which during good conditions, makes it possible to moor. Depth: on the quay from 0.5 to 4 m.
Winds: III and IV quadrant. Shelter: from the winds of the second and first quadrant. The small landing place, situated in the picturesque bay of Rinella is constituted of a wharf, where a pier of 100 metres starts, and makes it possible to moor liners, and to land touristic ships. In the Rinella bay, in front of the small beach, there is a boas camp, repaired by a quay on the west, and by a cliff on the east, but suffering from the winds blowing from the south. The boa camp offers the bus 24h service, and there is a diving centre inside the port, too. Pay attention to the rocks present circa 200m from the quay in correspondence to the Ariana Hotel, easily recognizable by the half- body statues, which compose the façade. Winds: NE summer; south-west and west in winter. Shelter: twenty of the II, III and IV quadrant. : twenty of the II, III and IV quadrant. Galera Slipway, situated on the northern side of the island, near to the commune of Malta, includes: a pier, going till the eastern side up to 80km. On the western side a curvilinear pier surrounds a perimeter. The port is equipped with a slipway. Pay attention to the low seabed near the pier’s head, and during the entrance proceedings to the port, as there are two cement outcropping blocks, situated at the centre of mouthpiece. At Galera slipway the amplification works are made. 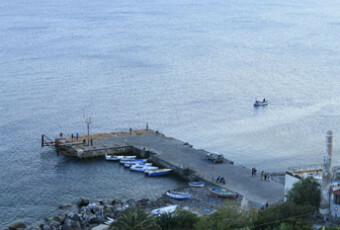 A pier of 50m, situated in Lingua fraction, permits a mooring of small boats on the southern side of a pier. Pay attention to sea bed, which do not exceed 2m of depth. 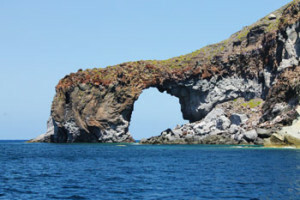 Between various activities you cannot lose the tour of the island, the best means to admire the sea, the beaches, and the bizarre rocky formations, and the residential centres with typical characterizing whitewashed habitations. If you have no boat, you can hire it, or book an excursion; there are a lot of agencies which do this work. Leaving from Santa Marina in northern direction, once passed a charming village, you will find yourself in few minutes at Scoglio Cacato, a place where it is possible to admire the volcanic origin of this bay immerged into perfectly clear and crystalline waters. The next stop is Capo Faro, characterized by a high rock surrounded by towering cliffs upon the sea surmounted by a lighthouse, where the most fearless can go through a steep mule track. 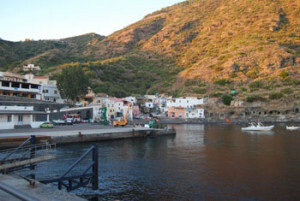 Going in the same direction you will find Scario Galera Port, you will find the port Scario Galera, surmounted by a peculiar commune of Malfa, where you then arrive. In Punta Perciato, where you will be welcomed by a suggestive arch of volcanic rock, shaped by sea and wind, which opens the view upon an amazing Pollara Bay, situated upon the remains of a collapsed crater; an extraordinary succession of small creeps, perpendicular walls, caves mounted in lava, enclosed on the North by Perciato, an unusual mount full of the shelters excavated in tuff, and dominated by the stack of Pollara. Like a castle, in the middle of the sea, it ergs as a protection of the one of the most beautiful bays of the archipelago, a real paradise for the fans of snorkelling. The Pollara Bay is enclosed by Filo di Branda on the south, a mighty rock upon the reddish sea. Once passed the Racina caves, Levi starts emerging , situated upon an upland of around 200 metres high, till you arrive to the picturesque fraction of Rinella, a small fishers’ village, where the unique sandy beach of the island is situated, surmounted by the caves excavated into the rocks, once used as shelters for boats. 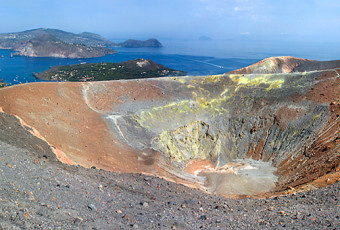 On the low and sandy depths, beyond the marine flora and fauna can observe the volcanic activity, consisting in phenomena called sconcassi (upheavals), which are manifested with gas emanation and vapours from depths. The tour goes on along the slopes of the massive Fossa delle Felci, till you reach Punta Lingua, where to admire the salty lake, the lighthouse which surmounts it, and small houses which sinuously create a contrast with the environment. The last piece of the coast, passing through the Canne and Pozzo d’Agnello beaches, till the Santa Marina port, is flat.